As a boy growing up in the sixties, I can still remember the major players in the insurance industry. Like a good neighbour, State Farm is there. (the jingle still rings in my head). AllState - You're in good hands. And Mutual of Omaha's Wild Kingdom show with the legendary zoologist, Marlin Perkins. This was a stroke of genius on the part of MOO because the show was parodied by Johnny Carson and numerous other comics of the day. I did some research and was trying to determine when insurance became a laughing matter. Many companies feel it's not. However the major players today have discovered, humour makes a lasting impression. So what insurance companies have taken the leap of faith and cast their fortunes to the pens of the comedy writers? Geico was an early adopter. I've featured them before in this blog because of their nimble ability to mix brands and visuals with the agility of a carnival juggler. Much of the ground breaking advertising you've seen today was created by Richmond Virginia's The Martin Agency. First, they have the Geico, the talking green reptile who, for some inexplicable reason has a British accent. The cavemen, Maxwell the pig, the bland salesman...all come from the minds of the Martin Agency. It's complex branding that somehow manages to push envelopes constantly while retaining a sense of brand unity that never let's you forget...it's a Geico commercial. Geico's "happier than..." campaign has drawn lots of attention. 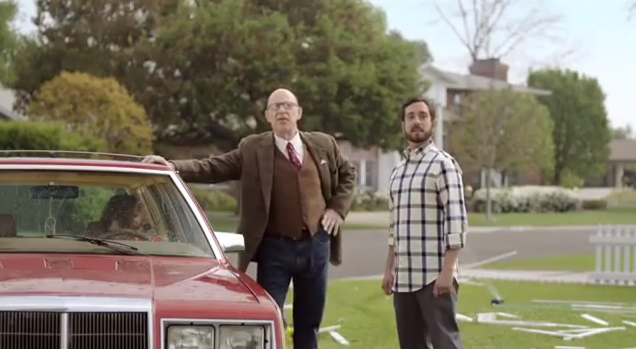 State Farm hasn't abandoned the decades of linkage to the "like a good neighbour" positioning line. But they too have connected their brand to humour. They've attached themselves to two shops and are doing some back and forth. DDB and Draft FCB are both working on the State Farm television brand as of this writing. This spot fires on all cylinders. It builds around the sales point that your agent is working round the clock, but does so with great writing and performances. I particularly like this creative from Farmer's Insurance. It's from Santa Monica's RPA. And you have to give full marks to the actors for having nerves of steel with the carefully choreographed scene where the teen's skidding car stops inches away. Humour is always a calculated risk. But who better to decide what is the most profitable risk management strategy? Any conclusive evidence? The only kind that counts. Growth. Geico is one of the fastest growing insurance companies over the last ten years and is poised to over take All State for the number 2 position in auto insurance very soon. And given that one of the shrewdest investors in the world, Warren Buffett, owns a large stake in Geico, you can count on other major players to be turning up the laugh factor soon. Time is short. I don't have time. There's never enough time. No time for that. No time for this. That'll take too much time. The time I don't have in the first place. How much time did it take to write this meaningless sentence about time. Too much...time. We rush around trying to squeeze as much into every day as possible. If I had a nickle for every time I've said "there's five minutes I'll never get back." This week, there isn't enough time to research and write an acceptable blog to show appreciation for the "time" someone put into creating a highly developed piece of advertising communication. So for the first time in the four year history of Creative Excellence Fridays, I won't. There will be no advertising today. No commercials. No youtube or vimeo links. Nothing really. This, today, to take the words of Seinfeld, is a blog about nothing, except, time. You won't have to jog your memory too much to think back to the last time you sat in front of a client, listening to him/her ramble on about what they think is really the right brand communication for their vision. And you think to yourself, hmm wearing a zebra suit, carrying a fire hose and covering yourself in flaming tar might be the right execution. It's at that point you realize, yes, I need a holiday. And holiday it shall be. 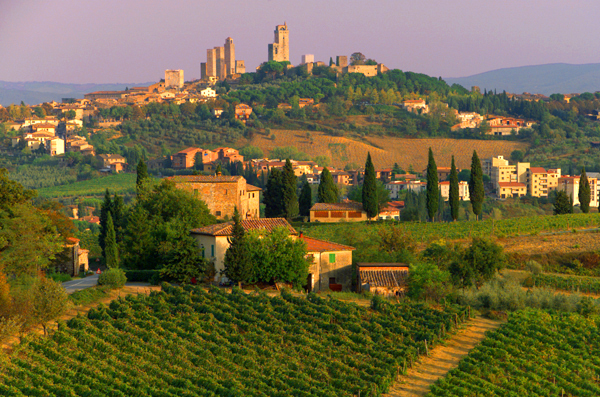 July 2-12 myself, Norma and Celia, will be working our way through Switzerland and Italy. We'll have our eyes wide open, absorbing the flavour, the visual parade of a thousand years of organized culture, and letting it all gestate. The end result? A rejuvenated, reborn brain, ready to ride that zebra into the abyss of renewed enthusiasm. All I can say is, thank the powers that be for Avion points. Mountain Coop has been successfully operating and pleasing greens and green wannabees for over 40 years. Now unless they know something we don't, they have decided to change their name. No it's not a radical change. Going from Mountain Coop to MEC (short form for Mountain Equipment Coop) is not complete blasphemy. But it makes no sense. The mountains say, outdoors, healthy. MEC says... "Eck!" ...or something similar you get stuck to the bottom of your shoe. You can understand the rationale when Kentucky Fried Chicken abbreviated to KFC. Fried...bad. KFC cool. I researched a bit and found some other questionable rebrand decisions. This one definitely tops the list. The Sci Fi channel in the States decided to rebrand itself as SYFY. When it was revealed to them, that was street urban language for syphilis, they had a rethink. One of the bigger head scratchers of recent rebrand history was Pepsi's process to modify their logo. They spent over a million dollars to come up with something that looks like it could be a logo for a new basketball league. The marketing team said the white swoosh was supposed to be smiles. Shareholders couldn't have been smiling when they saw the numbers. Great marketers know that you can create something from nothing. But turning something into nothing with a brutal rebrand is a skill all unto itself. What would happen if you put a vending machine made specifically for dogs into a park? Answer? You'd receive international press coverage. And to the best of my knowledge, dogs still can't read. But it didn't stop the designer from labelling various parts of the machine. Although based on the video below, the hounds seem to have figured it out without a lot of prompting. The doggy vending machine was the brain child of British dog food manufacturer, Bakers. 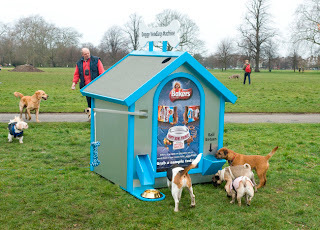 They hired animal expert Peter Neville to work with them to build the doggy vending machine with the intention of creating an experience for dogs and their owners. They positioned a videographer to capture the event and the end result was amazing. Next up, a viral that has 6 million hits. Leo Burnett really hit this one out of the park. I've seen ad creatives sharing this socially over the last two weeks. And when a jaded collective like that applaud a piece of creative you know it has to be very special. With advertising as it dips into the humour bag, we know that there are slight cultural idiosyncrasies that often make you think "what the heck was that?" Take Japan for example. 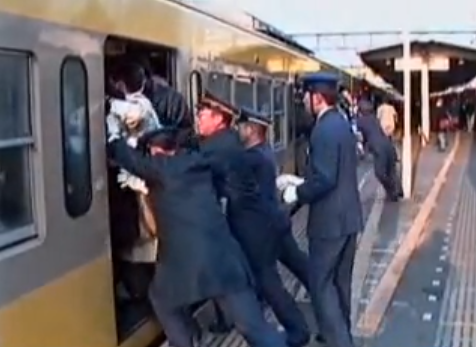 Here's a country where part of the daily routine is being jammed into a subway car at rush hour by professional "train stuffers" to ensure everyone gets in. Being in the advertising industry, it is interesting to see how some things remain the same; the desire to please the client at any cost, and the importance of keeping the stars happy. This commercial is long in length by North American standards and likely aired in theatre as well as viral. It comes from Dentsu Inc. which is pretty much a Japanese staple of industry, founded back in 1901. They are engrained into pretty much every facit of Japanese living. I especially like their tip on adding a little extra to the client coffee cup. Japanese commercials tend to have great production values and you'll often see North American themes carried over. Or in this case, a British crying game. Make no mistake, North American has borrowed liberally from Japan over the years too. Case in point, Akira Kurosawa. Japan continues to be an artistic hotbed of creativity. It's the cultural nuances that make it so worth watching.